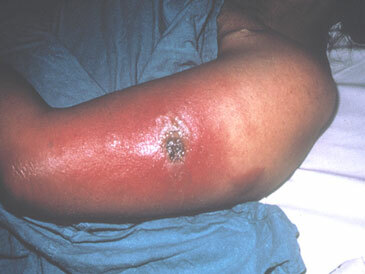 Progressive vaccinia (vaccinia necrosum) in patient with chronic granulocytic leukemia. Photo courtesy of John M. Leedom, M.D. 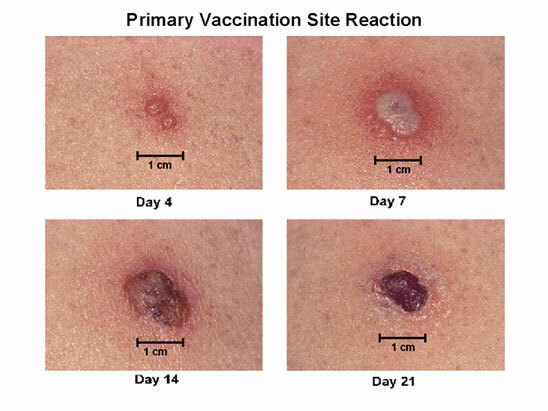 Major (primary) reaction  Expected vaccine site reaction and progression following primary smallpox vaccination or revaccination after a prolonged period between vaccinations. Multiple pressure vaccination technique used. Source: CDC. 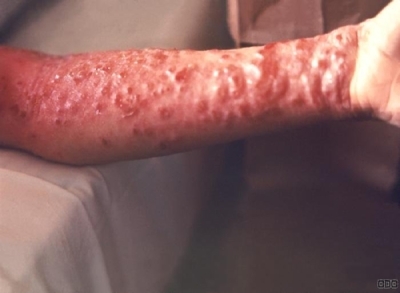 Accidental auto-inoculation of cheek with vaccinia virus, approximately 5 days old. Primary take on arm, 10-12 days old. Photo courtesy of John M. Leedom, MD. 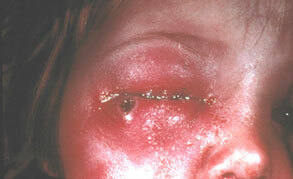 Accidental auto-inoculation of eyelid with vaccinia virus with concurrent cellulitis. Photo courtesy of John M. Leedom, M.D. 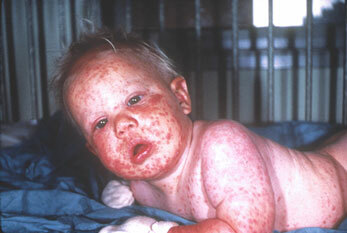 Generalized vaccinia in an apparently normal child. Recovered without sequelae. Photo courtesy of John M. Leedom, M.D. 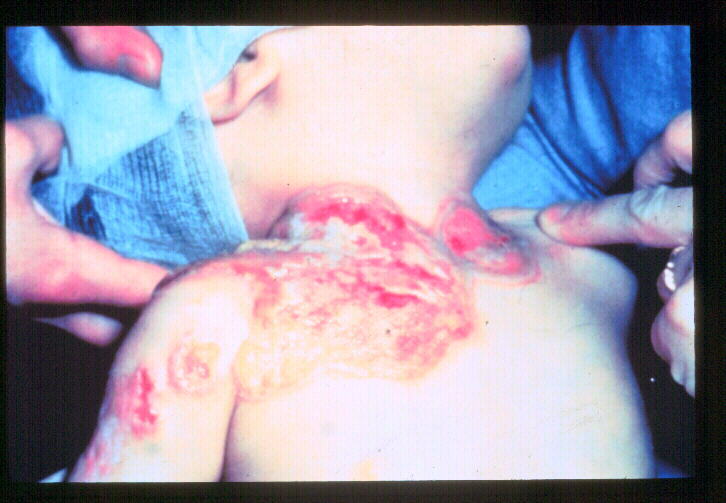 Eczema vaccinatum in contact to recently vaccinated child. 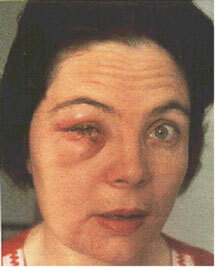 Recovered without sequelae or permanent ocular damage. Photo courtesy of John M. Leedom, M.D. 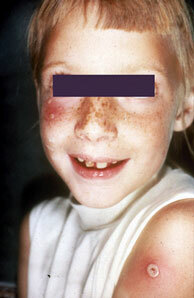 Eczema vaccinatum in an unvaccinated contact to a vaccinated sibling. [from Fenner F., Henderson DA, et al. 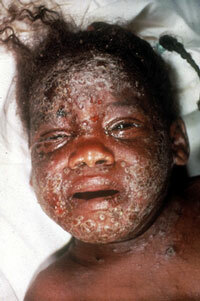 Smallpox and its Eradication. WHO. 1988]. Reprinted with permission of WHO. Original photo by I. D. Ladnyi. Mrs Helen Goates of Bolivar, Missouri. 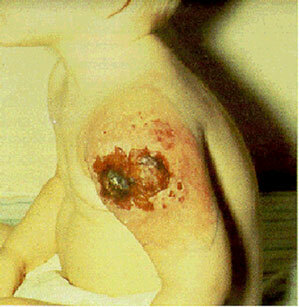 Cancer from vaccine. Benjamin Olevine of Altoona, Pennsylvania. Tumour developed from vaccine sore.